A birth certificate, issued by Manchester, New Hampshire City Clerk (City record vol. 9 p. 487), certifying that Elias (Louis) Samaha was born November 20, 1910 to Saleem Samaha and Rose Habib. A handwritten letter in Arabic and English. Written by Rev. 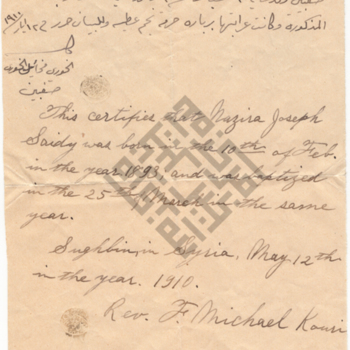 F. Michael Kouri, it certifies that Nazira Joseph Saidy was born on February 10, 1893 and baptzied on March 25, 1893. This letter, signed by Rev. Namtallah Jidoun on April 25, 1910, certifies Shafika Anton's birthdate as April 3, 1896 and baptism as April 25, 1896 in Saghbine, Syria. A certification of baptism of (name no clear) in August 1895. Written by Father Khouri Rafael (last name not clear) in 1910. The document is damaged. On the bottom are a few penciled notations: "Adla Kellil Father Joseph August 15 1895 Mary Kalil"
A record for Nassef Haddad, born February 2, 1910, detailing his school record. Filled out by the Lawrence High School, it provides the name of Nassef's father, Abraham, and residence, 281 Hampshire Street. A letter, written by Simon Abojalad from Kab Elias, Syria, on September 4, 1910. It testifies that Jahja Hawy, son of Namat Ulla Hawy, was born in Kab Elias and baptized on October 12, 1894.